Reusable and disposable Nebulizers sold separately and by case. High efficiency Nebs deliver prescribed medications and saline with short treatment times. Vix One nebulizer, disposable. Economical choice in small-volume nebulizers. Case of 50. 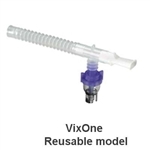 Vix One nebulizer, reusable. Good choice in small-volume nebulizers. Buy case of 10 and save. Reusable neb is dishwasher safe. Salter Labs - Small Volume Nebulizers, case of 10. Nebulizer with Anti-drool mouthpiece. Sold by case of 50. Reusable Nebs are dishwasher safe. Disposable Nebs can be cleaned in a dishwasher approximately 10 times before needing to be replaced. Nebulizers for infants through adults.